A line break in Excel can be used to end the current line and start a new line in the same cell. Notice that in the pic above, Morning is in the second row in the same cell. This has been done by inserting a line break in this text string. 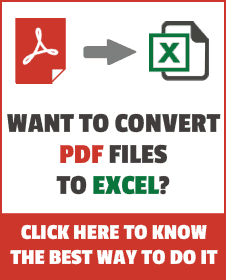 There are a couple of ways you can insert a line break in Excel. If you only have to do this for a couple of cells, using the keyboard shortcut would be the way to go. Double click on the cell (or press F2) to get into the edit mode and then get the cursor where you want the line break. Use the keyboard shortcut – ALT + ENTER (hold the ALT key and then press Enter). This would insert a line break at the right of the cursor. Note that you need the cell to be in the ‘wrap text’ mode to see the content appear in the next line. As mentioned, the keyboard shortcut is the way to go if you only have to do this for a few cells. But if you have to do this a lot of cells, you can resort to using Excel formulas. If you’re working with text data and want to insert line break in Excel formula results, you can do that as shown below. In the formula, where you want to insert a line break, add Char(10). For example, instead of =A1&A2, use =A1&Char(10)&A2. CHAR formula returns the character based on the ASCII code. And in this case, 10 represents the ACSII code for a line break. If the Wrap Text is NOT applied, adding Char(10) would make no changes in the formula result. Note: If you are using Mac, use Char(13) instead of Char(10). If you have to use Char(10) or Char(13) often, a better way would be to assign a name to it by creating a defined name. Go to Formulas –> Defined Name. 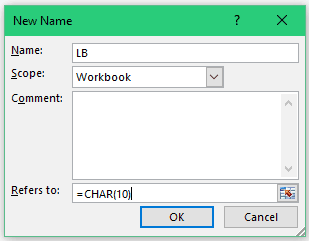 Now you can use LB instead of =CHAR(10).